The August to October outlook, issued 26 July 2018, shows most of mainland Australia is likely to be drier than average. Days and nights are likely to be warmer than average during August to October for most of Australia, with August days very likely to be warmer than average. These forecast warmer and drier conditions suggest that much of eastern and southern mainland Australia are less likely to see widespread respite in the coming season from current dry conditions. The El Niño–Southern Oscillation (ENSO) and Indian Ocean Dipole (IOD) are currently neutral. However, the Bureau's ENSO Outlook is at El Niño WATCH. See the Climate Influences section for more information. August to October is likely to be drier than average for most of mainland Australia. Chances are highest in the southeast, where there is a greater than 80% chance of a drier season for northern Victoria and southern NSW. Tasmania has roughly equal chances of a wetter or drier than average three months—so no strong indication either way that it will be particularly wet or dry. Much of eastern and southern mainland Australia have experienced a very dry first half of the year, so an outlook with increased chances of drier conditions indicates areas currently experiencing drought are less likely to see significant respite in the coming three months. Historical rainfall outlook accuracy for August to October is moderate over most of the country, except for interior WA, where accuracy is low to very low. Above average daytime temperatures experienced across Australia so far in 2018 are likely to continue. August to October days and nights are likely to be warmer than average for most of the country. The chance of warmer days is greater than 80% across large parts of northern and eastern Australia. Similarly, August days and nights are likely to be warmer than average for most of Australia. Much of the country has a greater than 80% chance of warmer August days. Historical accuracy for August to October maximum temperatures is moderate to high for most of the country but is low in parts of Tasmania and northern WA, and the southern two-thirds of the NT. Historical accuracy for minimum temperatures is moderate for the northern half of Australia, SA, and Tasmania, but low to very low elsewhere. 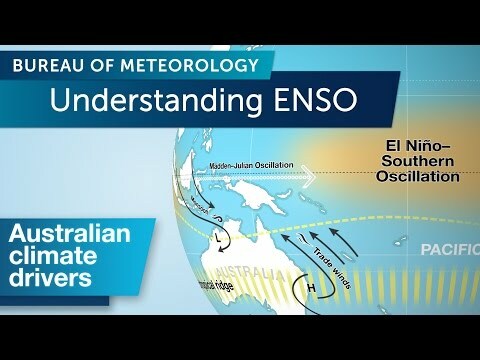 The El Niño–Southern Oscillation (ENSO) is currently neutral. However, most international climate models show El Niño is likely to develop before the end of 2018. El Niño typically means below average rainfall during winter-spring for northern and eastern Australia. Likewise, the Indian Ocean Dipole (IOD) is also currently neutral. About half of international climate models indicate a positive IOD event could develop in the coming months. A positive IOD typically means below average rainfall during winter-spring for southern and central Australia. While the Indian Ocean Dipole is currently neutral, forecast cooler than average waters to the northwest of Australia may change the path of weather systems coming from Australia's west, often meaning less rain over the central and southeast areas. The Bureau's model suggests that the westerly winds (and associated rain systems) that typically flow along the south of Australia at this time of year are likely to be weaker than average in the southeast of the country. Together, these factors (cool waters to the northwest of Australia and weaker westerly winds) are likely to be influencing the warmer and drier outlook for August to October. Much of eastern and southern mainly Australia have experienced a very dry first half of the year, so an outlook with increased chances of drier than average conditions indicates areas currently experiencing drought are less likely to see widespread respite in the coming three months. The high chance of warmer temperatures also means these dry conditions may be exacerbated by higher than average temperatures. 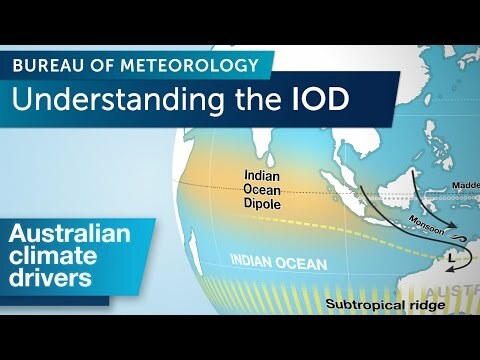 In addition to the natural drivers such as the El Niño–Southern Oscillation (ENSO) and the IOD, Australian climate patterns are also being influenced by the long-term increasing trend in global air and ocean temperatures. Bureau climatologists continually monitor the climate for any significant developments. See our ENSO Wrap-Up and Climate Model Summary for the latest climate information and forecasts of El Niño, and La Niña and the IOD.